oving every two or three years is what families in the military do, so Michelle Gaudreau doesn't remember Biloxi, Miss., where she was born. She does remember Texas, New Hampshire, Japan, Florida, Athens, Rome, New York, Denver and Anchorage. Greece is where she spent the formative ages of 7-11; Anchorage is where Michelle graduated high school and began to understand and trust herself. She was surrounded by a mature, creative and smart group of friends and a teacher she considers to be one of the main influences in her life. They all helped her discover her own originality and potential. Michelle now lives in Portland's Hawthorne/Belmont neighborhood. For Michelle Gaudreau painting is a non-intellectual, instinctive experience  almost a meditation. She sees an object, a landscape or a scene; it has a certain color, shape or mood that moves her in some way and she feels compelled to explore that poignancy and her reaction to it by reinterpreting it on paper. "My paintings are usually representational expressionist landscapes that convey mood to such a degree that, for me, the paintings become almost visual poems," she said. 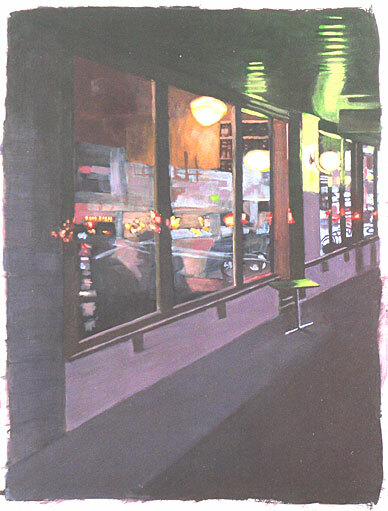 Michelle Gaudreau's "3 o'clock" (2005). Michelle's work is showing all month at Portland's Aalto Lounge, 3356 SE Belmont St.
"What poems do best, after all, is convey in metaphors a precise feeling, idea, story or mood that would normally escape description. Poems paint a picture in language of the ineffable." In her own way, that is what Michelle is trying to do with paint: express the mood of a thing, a moment, the weather, the time of day, her feeling, somebody's feeling  braided together with her mood while painting. "And I'm trying to do this in the most authentic way possible," she said. "Not authentic in draftsmanship or illustration, but in feeling. If I can get the image-feeling down authentically, then it is necessarily beautiful, since authentic things always are, even if the scene is melancholy or the feeling painful. So my paintings are beautiful, at least to me." 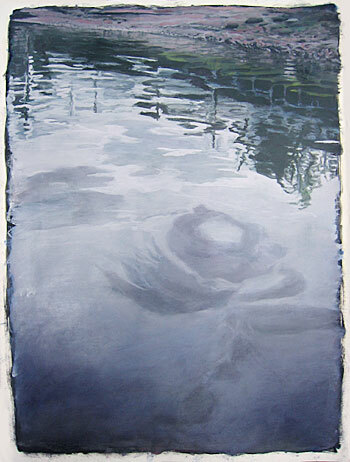 In her paintings, Michelle also tries to get at the "-ness" of a landscape or the "-itness" of the thing. Essentially, she seeks a thing's essence expressed as a sum of moment, mood and place. To this end, the subjects that interest her are often arbitrary slices of landscape presented without the context of conventional framing elements such as foreground, background, forms or images that are traditionally employed for formal balance. "I want the eye to land in the middle of the thing, in the clouds, in the water, in the tree's leaves," she said. "I want to express the nameless reality of the image and the moment that contains it  its inherent endlessness. This is what I aim for because it gives me something to walk toward. "But paintings, just like poems, have their limitations. They can't say it exactly. But even just trying to do it can give pleasure as well as relief to writers and their readers, artists and their viewers. We are all trying to make sense of the world and if trying is as close as we can get, then trying can sometimes feel sublime." 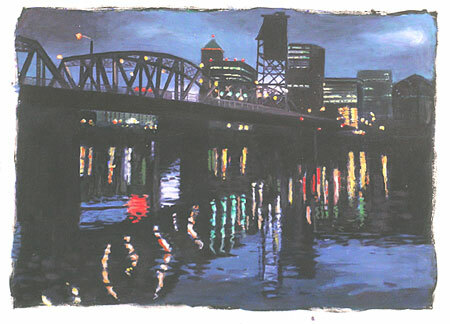 The paintings Michelle is showing this month at Portland's Aalto Lounge, 3356 SE Belmont Street, are different interpretations of recognizable Portland scenes. 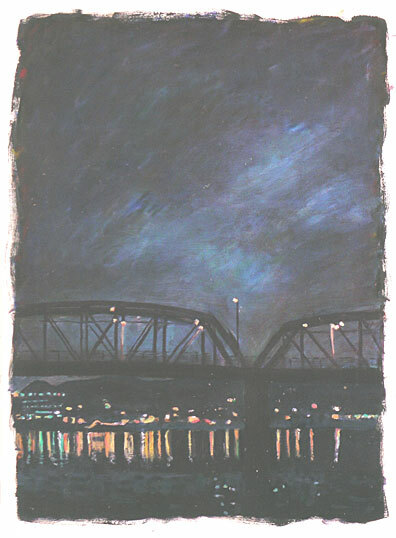 Most are images of the river, sky and bridges. "In five of them, I'm trying to get at what the French call l'heure bleu or 'the blue hour,' that precise moment at dusk where daylight and night light meet," she said. "It's a gorgeous, poetic moment when the sharp masculine shapes of day are transformed by the feminine, by the blueness of evening light into softness. It's neither day nor night, so everything you look at can be the color of whatever you are feeling. Blue can be purple, red, brown, gray. It's a poignant moment that transforms ordinary scenes into poignant scenes." 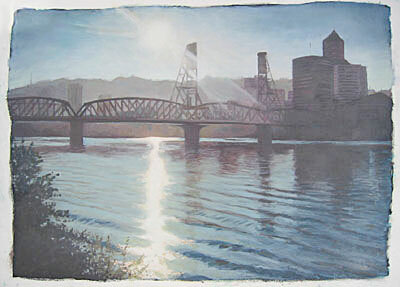 Other images at the show depict similar subjects but in different, very specific, daylight and weather. "I guess each picture is, well, some would say melancholy," she said, "but not dark or gloomy. There's something about them that feels true about the thing or the moment or the mood, so I think they are rather lovely." Michelle finds it wrenching to sell the paintings, but she's learned to let them go. "Two have already sold," she said. "They're still in the show, but with a juicy red dot next to them." Michelle's tastes have changed as her own artistic style has evolved. As a teenager she was obsessed with Leonardo da Vinci because he was an amazing draftsman and the all-talented Renaissance person she wished she could be. "My young ego wanted to be brilliant at everything I attempted and I wanted to attempt everything," she said. "Then came impressionism, which was very inspirational to me in college as I found my artistic voice ... Van Gogh and Matisse, especially." For a long time now, Michelle has been captivated by the art of Milton Avery, an East Coast colorist. "His subjects are simple landscapes and portraits rendered with a minimum of detail," she said. "They're the essence of a scene reduced to simplified, spare shapes or elements needed to get the feeling across, but painted with brilliant chunks of color that harmonize perfectly with the shapes to present an exact mood of moment, place, weather, emotion. "His paintings are a bridge between abstract and realist art, which is interesting to me because my own direction is going that way. "My landscapes are becoming simpler and more abstract, but not completely so. Painting a mood is what I am aiming for these days, and Milton Avery did mood like no one's business." Michelle grew up determined to act, write and paint because these art forms were the places where her talents, personality and philosophy of living converged. Even as a young child she instinctively felt that being creative was her job as a human being. "I'm convinced that our short human lives are utterly mysterious and impenetrable, and that the closest we can come to any understanding of what it means to be alive is to blend our imaginations with our observations and then pour the mixture out again, recreating the world and ourselves in the process," she said. "The best, most complete way to live out our moments is to stay curious and keep making versions of the world, keep creating names for our experiences, infinitely. And keep trying to find the names that fit, even though we never will find them. "This endless dissatisfaction is what keeps us moving, profoundly awake, continually learning, more fully human." Michelle thinks of being creative as a duty to herself, a duty that is also life's most significant, exciting adventure. Having had trouble over the years deciding which of her interests she should spend the most time on, Michelle chose to study English literature at Portland's Reed College because of her love of fiction and poetry. At the time she had more confidence in her writer-self than her painter-self. "And even though I intended to become an actress after Reed, because I had more confidence in my actress-self than my writer-self, I wanted to study English instead of acting because I didn't want to miss out on Reed's great reputation as a school that could really stretch me intellectually," she said. "I was planning to cover my bases as an actress after college by moving to L.A. to study film and TV acting." 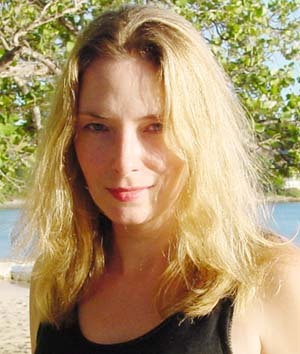 So in college Michelle read great works, acted in plays, wrote papers and took classical guitar lessons. But the whole time she painted, too, even though painting was the talent she had the least confidence in or understanding of. "Anytime I created something I liked, I was convinced that it had been an 'accident' and that I couldn't count on it happening again," she said. "Believing this sometimes paralyzed me. It made me afraid to make a painting I didn't like because that would 'prove' that I had been a fraud all along. "But I had it completely wrong. Making painting after painting that I didn't like was exactly the education I needed in order to evolve as an artist. I needed to learn what worked and what didn't, and thereby carve out for myself an authentic artistic point of view. Thanks to my art classes at Reed, I was required to make art week after week. I eventually grew comfortable with my failed attempts enough to keep attempting, and then I started to find my painter's 'voice.'" 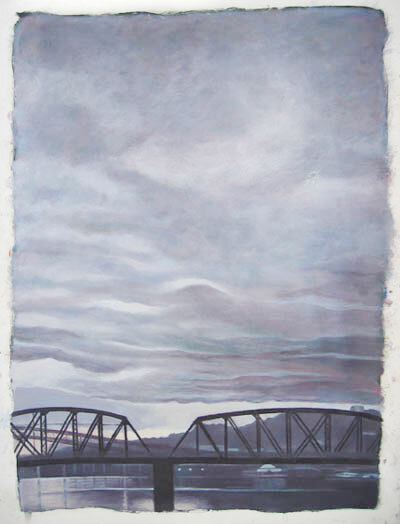 While at Reed, Michelle's interest in painting and drawing was nurtured by Portland artist and Reed professor Michael Knutson, who helped her get an art studio even though her major wasn't art. He also let her study independently with him for four semesters. She even had two art shows in the student gallery. "My English thesis became an opportunity to braid together my intellectual and artistic interests," she said. "It was titled 'By Metaphor You Paint a Thing: The Relation Between Poetry and Painting in the Poetry of Wallace Stevens.' In it I explored how creative acts have in common the aim of defining reality and, thus, of making sense of the world." Still, at that time, Michelle didn't take painting as seriously as acting or writing; it was just something she liked to spend time doing. She never analyzed its potential as a career, never even considered that it could be a career. "It was just always there, resting quietly in the background, a thing you do but barely notice while you're busy doing the other things that you are meant to do, like writing or trying to be in movies," she said. After college Michelle backpacked around Europe, moved to Hollywood to study acting for three years, grew to hate L.A. and the hypocrisy of the film biz and gave it up to travel some more. She spent almost two more years in Africa, the Middle East, Indonesia and then Europe again. After a stint of teaching English in Germany, Michelle came back to Portland eight years ago intending to write a novel about stripping, one of the many odd jobs she's taken in order to keep her life flexible enough to pursue creative interests. The book is still in the works, acting has fallen by the wayside and painting is finally taking its place as her primary focus. "I really believe that it's only because I have not been focusing on painting seriously until the last couple of years that I have allowed myself the freedom to develop as a painter," she said. "Creative people are notoriously insecure and afraid of failure. I've been too busy trying not to fail at acting and writing to care if I fail at painting. So my painting has been unfolding all this time behind my back, like a delicate new flower I've not been paying much attention to. And since it came into being without my forcing it or worrying about it, I can notice now, finally and calmly, that here is something worth looking at." Michelle paints with oils on thick paper that has been covered with black gesso, an acrylic base that waterproofs the paper and lends depth and richness to the oil color. These days, Michelle's goal with her art is to keep having shows. She likes the alternative gallery scene of Southeast Portland  the new First Fridays, the coffee shops, stores, bars and restaurants  because the art is edgier, the art-watchers open-minded and the scene laid back. "Deadlines for exhibiting keep me painting," she said, "and painting is my medicine. It's easy to become lazy or preoccupied with pragmatic issues of money and daily life, and to push art into the background because it isn't going to pay my bills every month. But the more I paint, the calmer, healthier and happier I feel, and that should be as much a priority as mundane matters of money." Long-term goals as a painter don't exist for Michelle right now. She just wants to make art and show it to people who get it. "One day I'd like to have the means to do nothing but write and paint, but right now I still have to make a living in non-art ways," she said. "I do admit it's getting scarier to live that way now that I am 41, but I really have no other choice if I want keep my life flexible enough to keep being creative. And I do." E-mail Michelle at micgau@earthlink.net. You can reach Kathy at kanderson138@comcast.net, and draw on other Sketch Pads.